Pic Happy shoppers enjoying the Christmas cheer will be deeply disappointed in online retailer ebuyer.com – after it posted jolly pictures of its staff wearing festive-themed jumpers to show what a heartwarming company it really, really is. But, as noted by Reg reader Phil, the firm's Xmas celebrations hit something of a snag, after one of the photos it posted on Facebook revealed that ebuyer rates its employees based on how many returns they reject. The photo was quickly yanked from the free-content ad network, after ebuyer belatedly spotted that displaying its leader board on Facebook was perhaps a bit of a foolish move. But El Reg has a copy of the pic, courtesy of reader Phil. It shows that a big incentive - presumably for bumper Christmas bonuses - at ebuyer is for the company's staff to decline requests for returns from stressed-out customers who are unhappy with their purchases for loved ones. The blue leader board displays a running score for each employee based on how many so-called return merchandise authorisations (RMAs) they have refused. We asked ebuyer why it had taken down the pic from a selection of photos in a Facebook album titled: "We are having a Christmas jumper day in the office today! Here are some of the team." Naturally, The Reg suggested to the firm that it perhaps realised - a little too late - that making public such a leader board was simply bad PR for ebuyer. 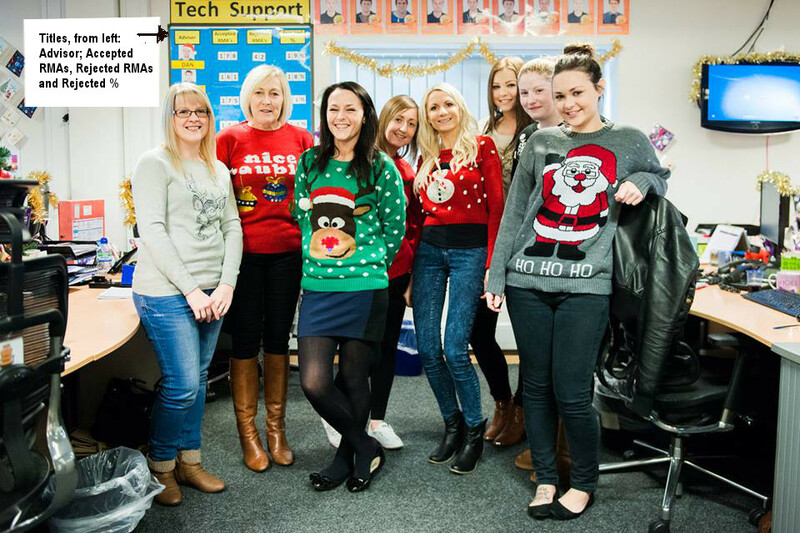 The photo was taken on our 'Charity Christmas Jumper day' and shows the number of returns we were able to avoid taking back by providing technical advice, for instance fault-finding with a printer which appeared initially defective - but was simply a configuration issue. The image was removed to avoid giving the wrong impression as the term 'rejected' can easily be taken out of context here and escalate, especially on social media channels.